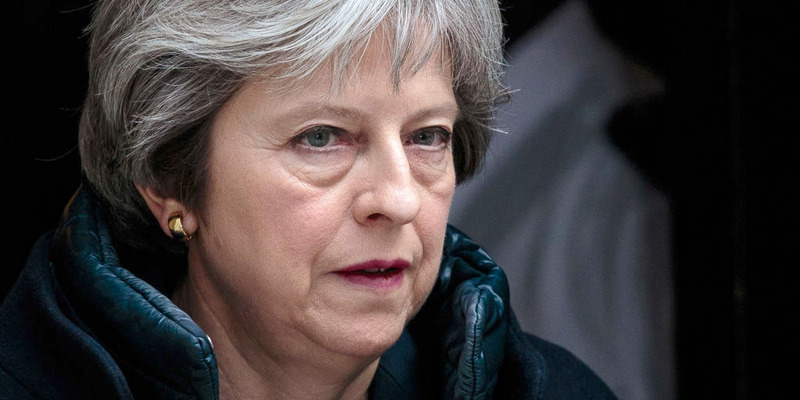 Jack Taylor / GettyTheresa May has just one year left to negotiate a Brexit deal. It has been exactly one year since Theresa May triggered Article 50 and kick-started the Brexit process. 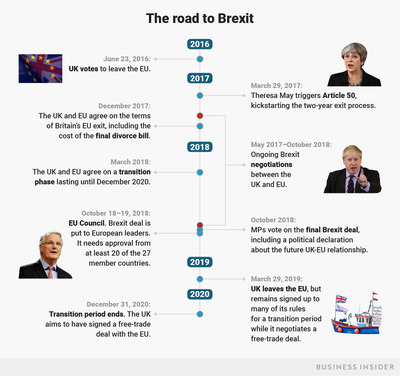 Business Insider’s Brexit timeline shows the already-tight two year schedule to negotiate the broad outline of a deal has become even tighter after a year of delays and fudged commitments. LONDON – It has been exactly one year since Theresa May triggered Article 50 and kick-started the Brexit process and now only one year remains until Britain is due to leave. Notable progress has been made on several key issues. Negotiators in December thrashed out the terms of Britain’s separation from the EU – including the contentious issue of a £39 billion divorce bill – and in March this year they agreed the outline of a transition phase which will prevent Britain from crashing out of the EU without a deal. May and her colleagues insist that solutions to all of these issues can be found in the next 12 months. But, as Business Insider’s Brexit timeline shows, the already-tight two year schedule to negotiate the broad outline of a deal has become even tighter after a year of delays and fudged commitments. Negotiators Michel Barnier and David Davis agreed at the European Council in March on a “large part” of the terms of an “implementation period.” That is a 20-month transition phase once Britain leaves the EU in March next year, during which the UK will be signed up to EU rules and regulations. That agreement brought an end to “Phase 2” of the negotiations. However, agreeing on a “large part” means there are still major issues to be resolved. The EU’s favoured mantra is that “nothing is agreed until everything is agreed.” That means Brussels won’t sign off a transition deal until the UK will comes up with workable solutions to the Irish border issue, Gibraltar, and other contentious parts of the draft EU Withdrawal Bill that still haven’t been agreed. This is the tricky bit. 1. The Withdrawal Agreement, which sets out the legal terms of Britain’s divorce from the EU. Key features will include the £39 billion divorce payment (already agreed), a solution to avoid a hard border in Northern Ireland, and commitments on EU citizens’ rights. 2. A political declaration on the “framework for the future relationship.” This will lay out the UK and EU’s ambitions for what their trading relationship will look like when Britain leaves. Principally, it will lay out the likely terms of a free-trade agreement, but will also touch on issues like security co-operation. Autumn 2018: A “meaningful” vote? Parliament Live TVTheresa May in Parliament on March 13. 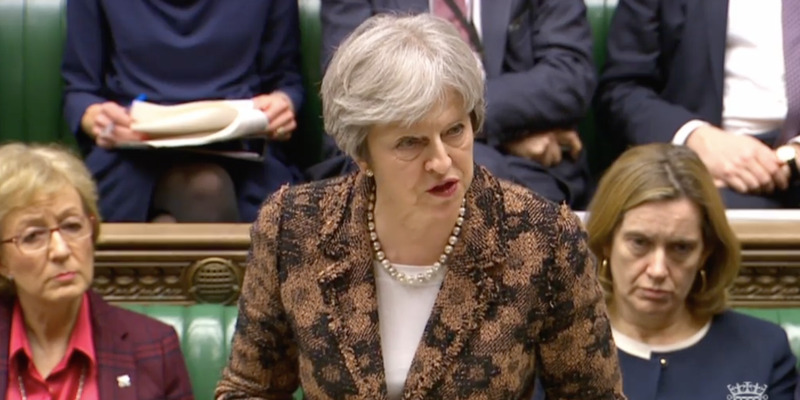 Theresa May repeated her commitment to give parliament a “meaningful vote” on the Brexit deal. The real question that has bugged Brexit watchers for some time is whether the Conservative party’s slender majority in parliament could see rebel MPs block a deal in parliament. However, Labour’s leadership indicated this week that it is likely to back a deal, which would make the parliamentary arithmetic much less complex for May, and turn the vote into something of a meaningless one. During this time, the UK will attempt to negotiate the details of a free trade agreement with the EU, as well as other countries around the world. It will attempt to find solutions to issues including how to protect the UK’s vital financial services sector from the loss of the EU’s lucrative financial passporting regime. If Theresa May sticks to her current commitments, the UK will no longer be a member of the EU’s customs union or single market. It will hope to have agreed a free-trade agreement with the EU, its largest trading partner, that limits the economic damage that results from its loss of single market access. It will also aim to have signed a raft of free-trade deals with other countries which ministers say will give Britain a significant economic boost.